Egyptian authorities allowed goods to enter the Gaza Strip through the Rafah border crossing during the past four days, including shipments of cement, iron, wheat, food and medical supplies, the German News Agency DPA quoted Gaza's Economy Minister Abdel-Fattah Abu Moussa as saying. The step came one day after a delegation from Gaza's Ministry of Interior, under the control of Hamas since 2007, arrived in Cairo to discuss border control with Egyptian officials. Egyptian authorities opened the Rafah crossing on Saturday for four days for humanitarian purposes. 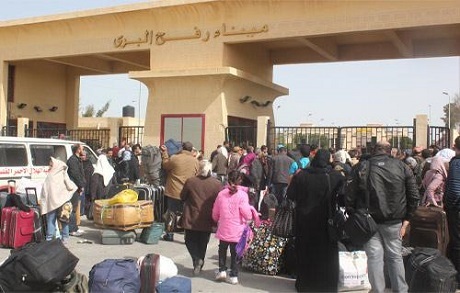 A media official with the Palestinian side of the Rafah crossing, Wael Abu-Omar, said that Egyptian authorities allowed during the past days the crossing of 2,624 Palestinians for humanitarian reasons and Egyptian passport holders. Abu Omar called on Egyptian authorities to allow more goods to enter Gaza to help alleviate the effects of the Israeli blockade imposed on the Strip since 2006. The Rafah crossing has been closed by Egypt for several years for security reasons, though it is periodically opened for humanitarian purposes. On Friday, senior Hamas official Ismail Haniya hailed what he described as improving ties with Egypt. Hamas released a statement on Saturday describing the visit by the Gazan delegation to Egypt as "successful," adding that the delegation had a series of "fruitful meetings" with Egyptian officials, including the head of General Intelligence Khaled Fawzy. Last week, Hamas leader Mahmoud El-Zahar said that the group's relations with Cairo have improved, evidenced by the reaching of an agreement on border control between the Gaza Strip and Sinai, state news agency MENA reported. El-Zahar said in statements published by the Palestinian El-Ra'i news website that a delegation of Hamas representatives met with Egyptian officials in Cairo earlier last week, including deputy head of Hamas' political bureau Ismail Haniyeh. Relations between Egypt and the Palestinian Islamist group became strained after the ousting of Egyptian Islamist president Mohamed Morsi in July 2013.